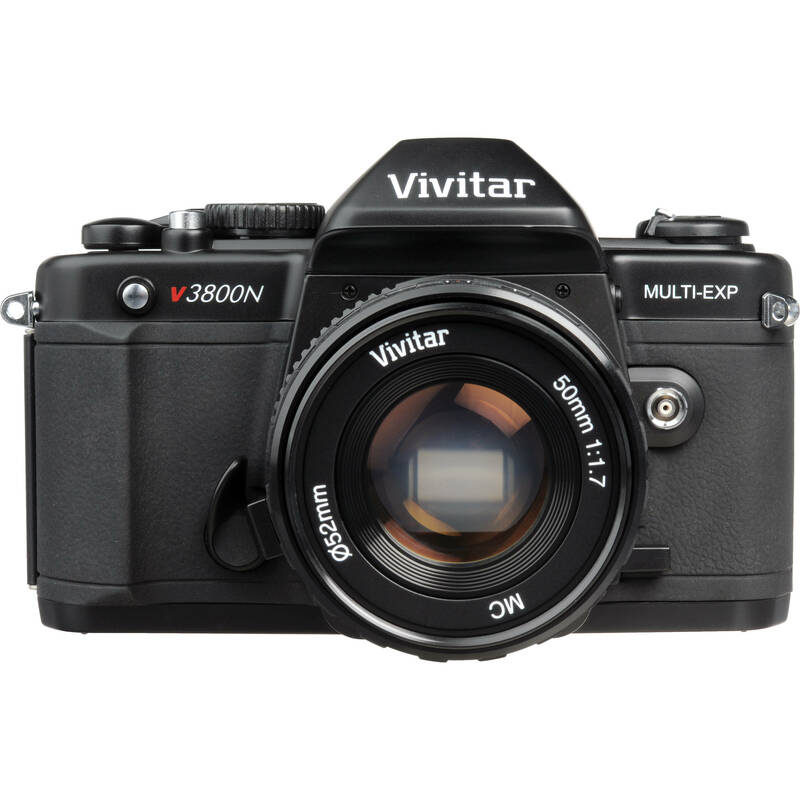 A basic, all-manual SLR combination for students, the Vivitar V3800N 35mm SLR Camera with 50mm f/1.7 Lens will help you learn the art of photography the old fashioned way. Load, advance, and rewind the film yourself. Determine exposure manually with just a simple match diode centerweighted meter, and enter the settings on the aperture ring and shutter speed dial. It can use any Pentax K-mount lens which has an aperture ring. You'll only need small, long-lasting button batteries for the meter (the shutter is all-mechanical) and some film. The V3800N is a basic camera that's a great teaching instrument and fun, too. Though the V3800N shares many traits with other student cameras from other makers, it does have a few advantages. You can make multiple exposures on a single frame with the V3800N, there's a self timer as well, and a depth of field preview allows you to see the actual range of sharpness in an image before making the exposure. This version of the V3800N includes a fixed 50mm f/1.7 lens that is bright, sharp, light, and shares the focal length preferred by many famous 20th century photographers. Its large f/1.7 maximum aperture allows you to shoot handheld in much lower light than a zoom lens. Box Dimensions (LxWxH) 7.1 x 5.4 x 5.3"
V3800N 35mm SLR Camera with 50mm f/1.7 Lens is rated 4.1 out of 5 by 47. Rated 1 out of 5 by Photo Teacher from Warning: Poorly made and no service I bought 35 of these for my high school photography program because we had Pentax K-1000's which lasted decades. They are no longer produced, and this is a knock-off that even has the same lens mount to use the old Pentax lenses. 7 had problems right out of the box, and after 6 months, half of them are jammed, or the light meters don't work, the hook for the strap to the camera broke, or the wafer thin battery cover crumbled. You can't even get through to Vivitar any more for service. This purchase was a disaster! Rated 2 out of 5 by West Texas Photo Teacher from 50/50 Luck of the draw I am a photo teacher and ordered a set of 10 for a new class. With those that came brand new, only half of them worked and the other half had a faulty light meter or broken shutter right out of the box. Of the ones that worked, they work just fine and have lasted a year and a half of high school abuse. I just would not recommend it to anyone looking to buy a manual camera, there are better ones out there. Rated 2 out of 5 by Photo Teacher from Poor Construction I teach a photography class and purchased these cameras to replace some very old K1000's. The battery holders began breaking almost immediately. I have not been able to get any support from Vivitar and am having to replace the battery holders with some made by another company. I would not recommend this camera. Rated 4 out of 5 by Anonymous from Does the job for begginers Use for college level photo classes. Great first camera. Viewfinder rubber piece falls off camera often. Viewfinder a little dark. Camera is sturdy, loads easy and works well. The case it comes with is outdated and annoying.Overall good for the money but not for the professional. Rated 5 out of 5 by Anonymous from First camera I use my SLR for a photography class, and it's my first camera of this kind and it's useful because its simple to use and not so complicated. So far I have not had any problems with my camera, everything works fine and I'm satisfied with the product and with the delivery. Rated 1 out of 5 by Archaeo photographer from Poorly constructed and didn't last Our first camera arrived broken. B&H exchanged it for a new one, which promptly broke after about 5 days of use. I can't get through to Vivitar as the company hsa been taken over by another company. Spend a few extra dollars for a camera that will last. Rated 4 out of 5 by Pete from Pretty decent for the price I bought this camera off of B&H over a year ago. For a while it was strictly my only camera. For what it is, it's pretty nice but most importantly works. The price is pretty much spot on for the camera. The first thing I noticed was the incredibly simple and lack luster manual. But again for the price, not a big deal. The camera is rather intuitive, it's simple to use and understand so I haven't picked up the manual since receiving the camera. I've had no issues with the light meter, which is surprising. Thankfully it uses an easy to find battery but what's even better is that since I bought the camera back in early 2010 and have been putting it through it's paces I have yet to have to replace the batteries. The lens isn't anything to write home about. It's decently fast at f/1.7 and works. The lens mount has been around for a while so you can pick up plenty of other lens as well if you see the need to. Personally a 50mm prime is all I need. The lens feels sort of cheap but has a rather smooth focus throw so that's nice. The lens cap is cheap but what do you really expect? It is a 52mm filter size so you can get a new one or plenty of different filters seeing as it's a popular filter size at any electronics or camera store. The lens has half-stops from f/1.7 to f/16 so that's a nice touch. One of the rings on the lens (the one featuring the distances in focus when at certain f-stops) has gotten loose on mine. It's really not a big deal but it's kind of annoying. But then again I don't expect much from a Chinese made lens (no offense). The controls of the camera are plastic and they feel plastic. The film advancing lever is nothing special and to expect something special from it would be strange. All the controls do their job and that's it. There have been a couple times where I thought the film rewinder was gonna break but I haven't broken it yet. The viewfinder is a pretty simple thing as well. There are three LEDs on the right side that display if you're overexposed, exposed properly or underexposed. The overexposed and underexposed LEDS are red while the properly exposed one is green. Again, pretty simple. It's not a 100% view viewfinder but that isn't expected for this type of camera. The eye piece on mine kept sliding off so I just put some double-sided tape on it and slid it back on. It hasn't moved since. There is a no diopter (that I know of) but I have good eyes so that doesn't bother me. Film loading with this camera is ridiculously simple. If you've ever loaded a film camera before you'll know what to do. If you haven't, it takes 3 seconds to learn. It's not a super fast process but I don't think this camera is targeted towards someone who needs super fast film loading. The camera itself is a lot smaller than I thought it was gonna be but I have large hands. It has some nice weight to it. The top of the camera seems to be made out of metal while the bottom is plastic. The build quality of it is pretty decent. You definitely get what you pay for. It's no Leica or high end Canon or Nikon that's for sure. The paint on the camera is pretty durable and shows no scratches. Because of the small size and my large hands holding the camera can be kind of awkward at first. I figured out a comfortable way to hold it while shooting though. The shutter is rather loud but again, that's no big deal. All shutter speeds seem to be accurate. If they weren't I would have had issues with the light meter, which I haven't. Included with the camera are so random little accessories. There's a rubber lens hood, which I lost, and some weird thing that screwed onto the filter threads (shows how much I know about it). I found the strap that was included uncomfortable and ugly so I use the camera strapless. The camera is absolutely no-frills. It works. I use it nearly everyday for everything. I really have no reason not to rate it 5 stars but I won't. It works perfectly fine. I would definitely recommend it if you are looking for a NEW 35mm film SLR to learn on or just to have. For the price though you may want to look at some used 35mm film cameras. There are some great deals out there. If you want something with a warranty though this is the camera for you.